The University of Aberdeen and CCAFS are developing a simple tool for practitioners to quickly identify and compare mitigation options for agriculture. The CCAFS-MOT tool takes account of current farming practices and growing conditions to suggest a wide range of mitigation options. The Excel-based tool is free and downloadable from the CCAFS website. CCAFS. 2015. 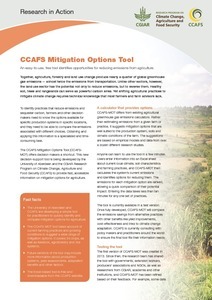 CCAFS Mitigation Options Tool. Research in Action. Copenhagen, Denmark: CGIAR Research Program on Climate Change, Agriculture and Food Security (CCAFS).